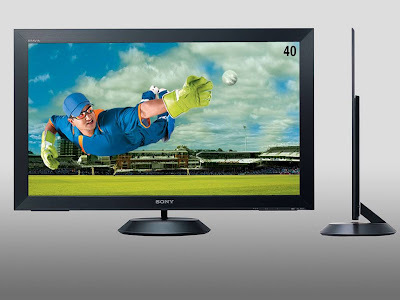 A revolutionary design, BRAVIA ZX1 is the world slimmest LCD TV measuring a mere 9.9mm and weighs about 15kg. The ZX1 comes with many ruling technologies to contribute quality images and breath-taking digital entertainment experience. At the heart is Bravia Engine2, surrounded by Edge LED technology, Motionflow 100Hz and Image Blur reduction as image techniques to create premium pictures with vivid and vibrant tonal range. ZX1 comes with a Full HD display resolution of 1920 X 1080 pixels, and is a charmer with glossy black bezel and screen. Apart from the usual BRAVIA features like Live Colour Creation, 24p Cinema, Xross media bar, BRAVIA Theatre Sync, the BRAVIA ZX1 has outstanding audio enhancement features like digital amplifier, S-Force Surround, voice zoom, dolby digital plus, etc. This screen has two integrated speakers and a woofer that deliver a net output power of 20 watts (5 Watts for each speaker + 10 Watts for woofer). Sound effects will be amazing!